Home » Vessel Sinks » 30" to 39" » Moderna 37"
Our Moderno sink cabinet has a sleek and beautiful design, which will complement many of today's modern bathroom decors. 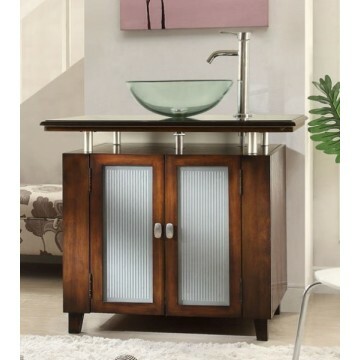 This bathroom vanity features durable wood construction with a 3/4-inch thick hand-polished granite top, tempered glass bowl and chrome finish faucet is included at this special low price. Replace your old sink easily with the stunning Moderna bathroom vanity sink cabinet.